a dedicated chess computer developed by Intelligent Software based on their experimental development program Intelligent Chess Software, which in turn was based on Richard Lang's Cyrus , written in Z80 assembly language. The computer had a 16 KiB ROM, and a 2 KiB RAM, the Z80 processor ran at 4 MHz in the customary version. 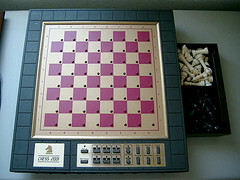 The machine was manufactured by Newcrest Technology and released for sale in early 1984 as CXG Chess 2001. It was further sold in the USA as the ComputaChess Champion and in Australia as Hanimex HCG1900 . Chess 2001 played a strong European MCC 1983, becoming runner-up behind Advance 3.0, and two Chess 2001s at 8 MHz competed at the WMCCC 1983 in Budapest , finishing 6th and 8th out of 18 competitors. This page was last edited on 13 April 2019, at 06:59.